While PCS is primarily focused on the Washington state and the Northwest, through our partnerships and requests for assistance we have had a significant national and international reach. Afghanistan, Algeria, Bahrain, Bangladesh, Cameroon, Chad, Egypt, Guinea, Kenya, Lebanon, Liberia, Jordan, Mali, Mauritania, Morocco, Nigeria, Pakistan, Palestinian Territories, Rwanda, Saudi Arabia, Senegal, Sri Lanka, Syria, Thailand, Trinidad, Yemen, and Zimbabwe. With social media we have stayed in touch with some of these delegates for years after! 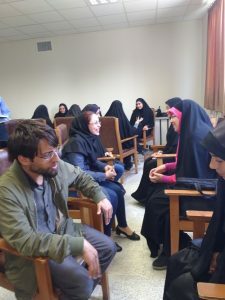 In April of 2016 PCS Director, Roger Kluck was invited to help carry AVP into Iran! 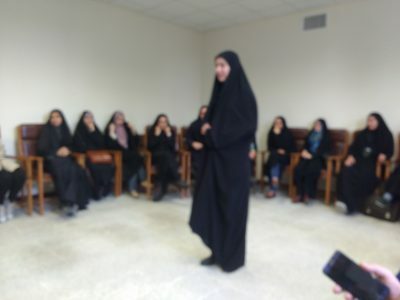 We held a mini-workshop in Ferdowsi University in Mashad and created contacts with the U.N. Peace museum in Tehran and are continuing to seek to bring workshops into these locations. 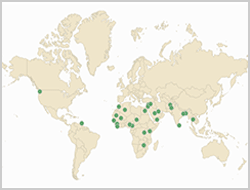 AVP has done violence prevention and recovery work in over 60 countries around the world. Through a wide array of independent NGOs and groups AVP does work in refugee camps, prisons and jails, with gangs, child soldiers, schools, and villages around the world. AVP-International serves to network and support these independent efforts, translating manuals, assembling traveling teams of facilitators and more. Through our relationships with AVP International we have helped peace workers from around the world on their informational and fundraising trips. PCS Director, Roger Kluck now serves as the North American representative to the AVP-International Coordinating Committee. In 2012 we hosted Nadine Hoover, of Friends Peace Teams, to introduce the powerful AVP-Trauma Recovery workshop format she developed in Indonesia to our Pacific Northwest facilitators. In 2013 our facilitators went to Victoria, British Columbia to share this format with Canadian facilitators from across Canada. In 2011, PCS executive Director, Roger Kluck (then serving also as President of AVP-USA) attended the AVP International Gathering in Antiqua, Guatemala to hear from 100 AVP facilitators from 6 continents and to be trained in several trauma recovery programs from Kenya, Indonesia, Colombia and Guatemala. In 2010 we helped host David Zaremka, founder of the African Great Lakes Initiative which does AVP and trauma recovery work in Kenya, Burundi, Rwanda and the Congo. We helped arrange speaking engagements and fundraising opportunities for his work with Friends Peace Teams. In 2007, PCS executive Director, Roger Kluck spent a month in Guatemala and EL Salvador with Friends Peace Team AVP facilitators, helping facilitate workshops, provide facilitator training, and explore new partners for AVP violence prevention work. PCS is active through AVP – International and AVP –USA networking with facilitators around the world. PCS participates in various committees in these organizations including the research committee, conference committees, and outreach committee. PCS has recently begun investigating applying AVP to counter violent extremism and radicalization. Various AVP groups around the world have been doing this work already. PCS is interested in coordinating the learnings from their experience and offering this expertise to organizations battling extremism and radicalization around the world. 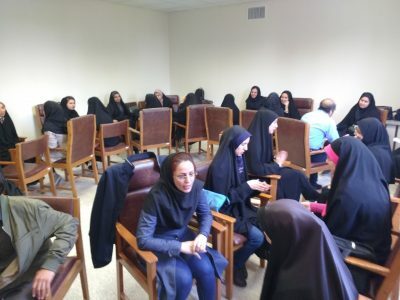 With 40 years of experience in over 60 countries and a network of facilitators around the world, AVP is uniquely situated to help in this work. In 2011 PCS executive director, Roger Kluck was flying back from the AVP International Gathering in Antiqua, Guatemala and found himself sitting next to Dr. Jennifer Hoock, a Seattle Group Health physician in charge of Family Medicine resident training. Dr. Hoock had recently established Guatemala Village Health, an NGO bringing medical treatment in to rural villages. In the course of friendly conversation they learned about each other’s work. Dr. Hoock enthusiastically declared the villages she worked in could use AVP conflict training to deal with domestic violence and youth violence. PCS has since facilitated two AVP conflict transformation workshops in Seattle for Guatemala Village Health staff and board members. Through our relationships through AVP-International PCS also helped arrange trainings in Guatemala as well. And Guatemala Health now has its own AVP facilitators running workshops in their villages and one of their faciltiators is extending it into Guatemala City to work with gangs. 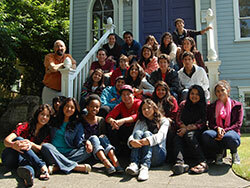 Guatemala expects to have 20 trained facilitators by 2016! 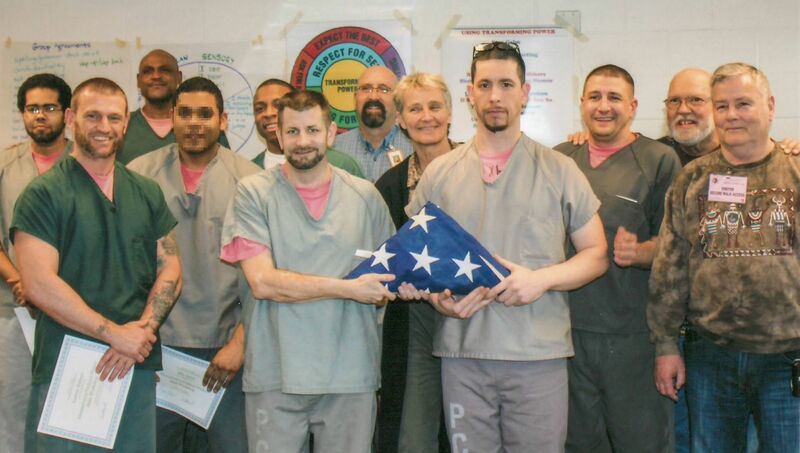 In 2014 PCS was approached by Trauma Healing and Recovery Services (“THARS”) to do workshops for their board. THARS does AVP and trauma recovery work in Burundi. Their board is in the U.S. As they were preparing to launch a pre-election violence prevention program they wanted their board to experience AVP so they would better understand the work they wore supporting in Burundi. 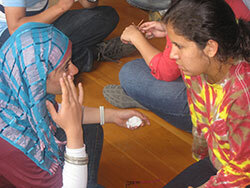 PCS traveled to Wenatchee, Washington and ran a well-received Basic Workshop. THARS invited local community counselors, clergy and teachers to participate also. This group is now discussing how to start an AVP chapter their community. Meanwhile THARS has gone to train several 100 AVP facilitators in Burundi ahead of the July 2015 election. PCS occasionally answers calls from AVP programs across the country and from other countries for facilitator help or other assistance. In 2014 and 2015 PCS sent facilitators Lisa Roy and Roger Kluck to Alaska to help restart AVP in the state. PCS has now facilitated four workshops in Fairbanks and Anchorage. This September AVP-Alaska graduated its first new class AVP facilitators! It is nice to know we played a role in planting this seedling. PCS connected long time AVP facilitator Karen Cauble of Homer with the Fairbanks AVP community and together they are staring a new local Alaska AVP council. We need to recognize too the important support Dr. Brian Jarrett, the Director of the Program of Dispute Resolution, Peace Building and Restorative Practices at the University of Alaska Fairbanks in furthering AVP in the state. 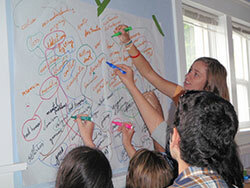 In 2013 PCS coordinated with AVP in British Columbia to do the first Trauma centered Advanced AVP workshop in Canada. John Michaelis and Roger Kluck, who had taken trauma training in Guatemala and with Nadine Hoover’s Indonesian program in Seattle, traveled to Victoria to run a workshop for AVP facilitators from across Canada. We hope this work takes seed there. We are staying in touch with AVP British Columbia to offer any assistance we can. In September of 2013, PCS executive director, Roger Kluck, took part in an incredible AVP project. American Paradigm Charter schools wanted every student in two high schools to have AVP training in the first week of school. AVP sent facilitators 70 from across the country to Philadelphia to host 27 simultaneous workshops for 550 students for the first 4 days of school. It was an incredible undertaking! Roger brought back a lot of experience to apply to two school workshops in Seattle the following week.